After my “Amityville Horror” edition last week with it’s freezer mishap I really wanted to make sure that I did better so I’ve gotten my waste down to one lonely head of lettuce that got put to the side and not tended to before it went gushy and black. 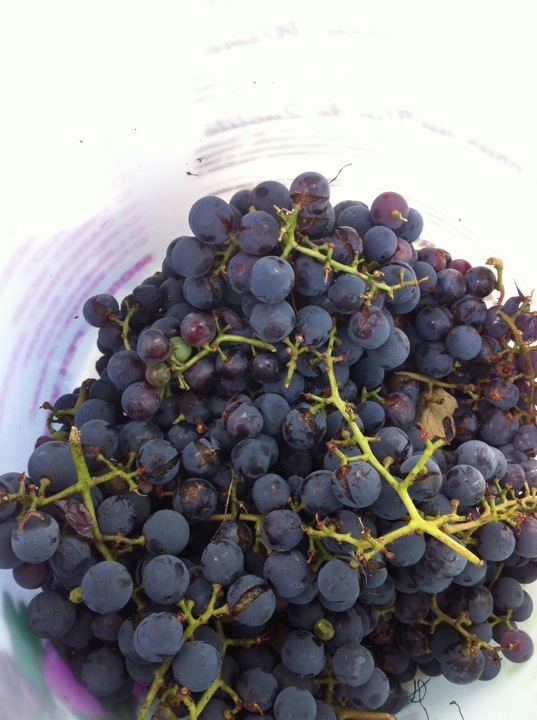 I also was able to save all of my pretty grapes that have been dutifully growing and ripening under the arbour all summer. I love my grape vines. They give me shade and all this gorgeous fruit. 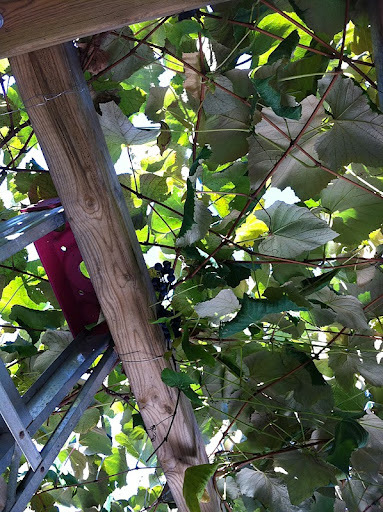 Believe it or not they are only four years old but have managed to cover a nine foot pergola even with judicious pruning. made juice out of the rest. I actually had three big pots of juice. 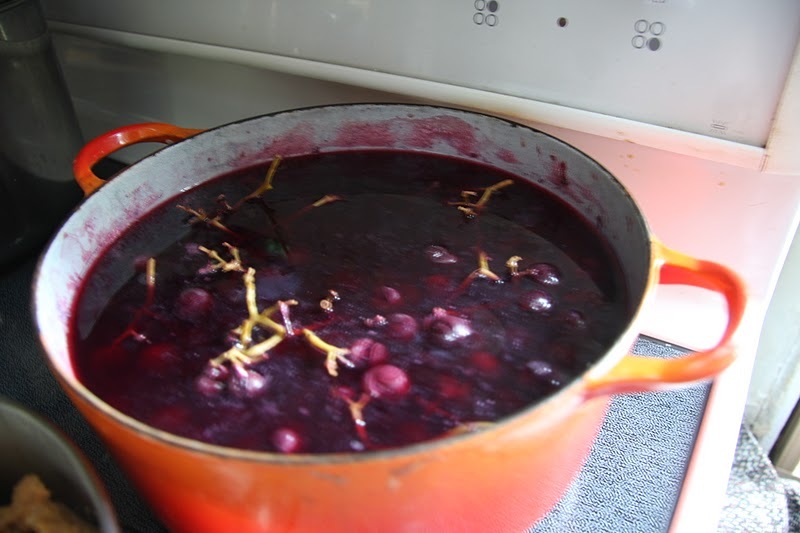 Simply take your grapes add enough water to cover and boil the heck out of them for 20 minutes. I’ve kept half the juice just for drinking and the other half I made into jelly. I’m not going to go into the recipe as I just followed the recipe on the good old Certo (pectin) box. 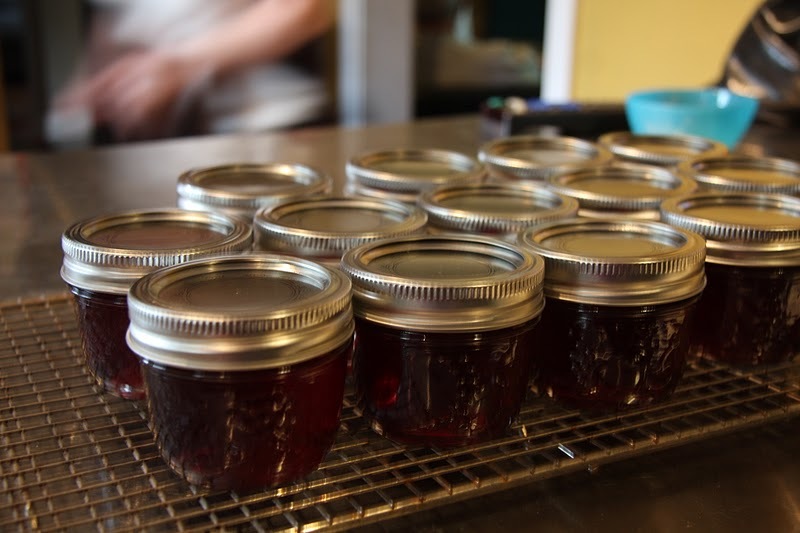 Instead, if you haven’t made jelly (or jam) I’ll just mention a few things to keep you safe and to make your canning successful. This is one of my few regrets this summer. I have canned almost nothing-usually my cupboard in the basement is brimming this time of year with pickles, chutneys, jams and jellies but the reno took precidence this year. When you are told to skim off the foam this is the stage you are looking for. 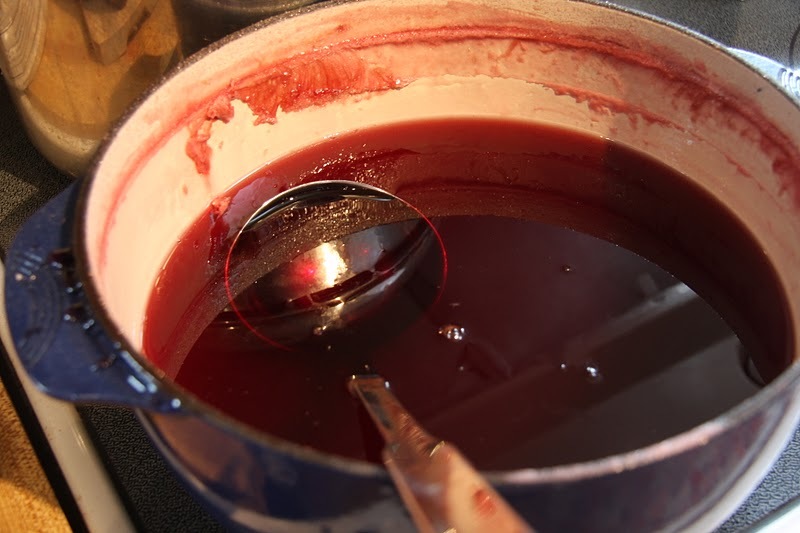 The light, foamy stuff will prevent your jelly from setting and could possibly lead to extra air (breeding bacteria) being trapped in your jelly. Start your sterilizing. I like to use copious amount of boiling water. Here are my jar tops having been sterilized (moved using sterilized tongs) and soaking in more boiling water so that the rubber will be ready to seal. 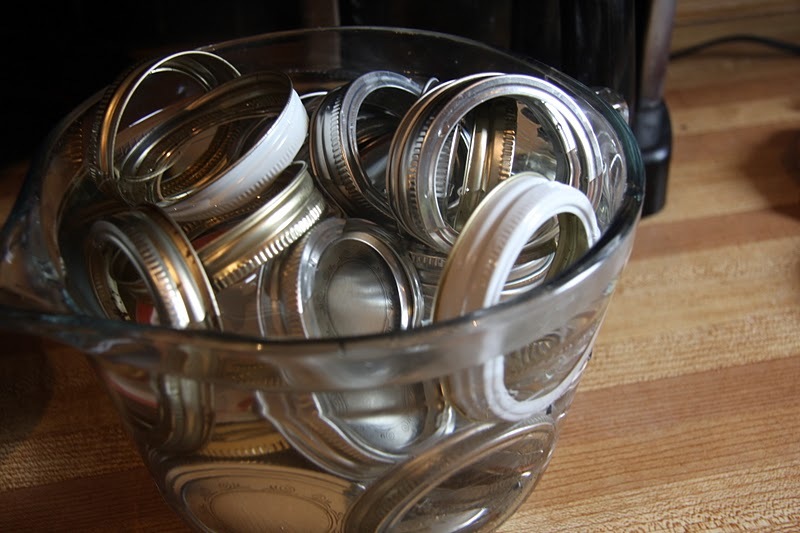 MORE boiling water will take care of your jars. Remember that the rims need a good dosing of water too. Fill your hot jars with hot liquid. Ensure you have no drips along the top as this will prevent sealing. Fill a deep stockpt with yet more boiling water. I like to add a round rack to the bottom to prevent my jars from jiggling and potentially cracking. If you don’t have one you can always ball up a layer of tin foil to cushion. 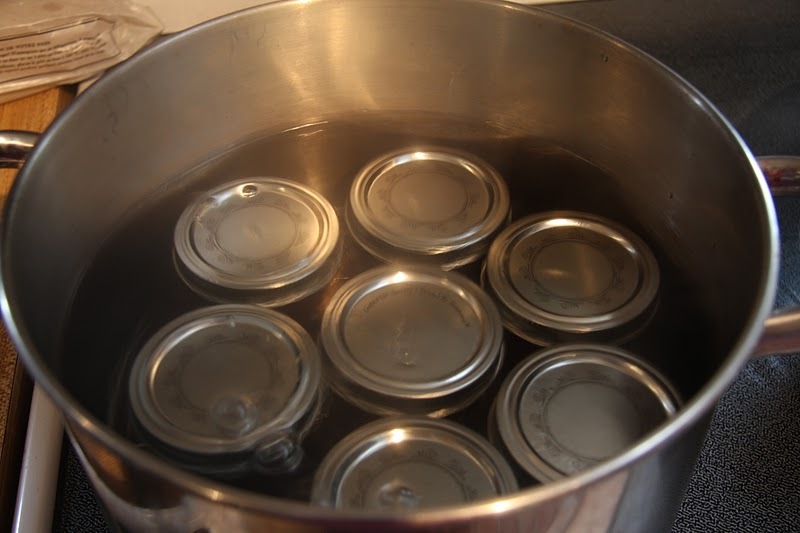 Add jars (the water should just to the top) and boil for 11 minutes (my mom always did 11 so I do). 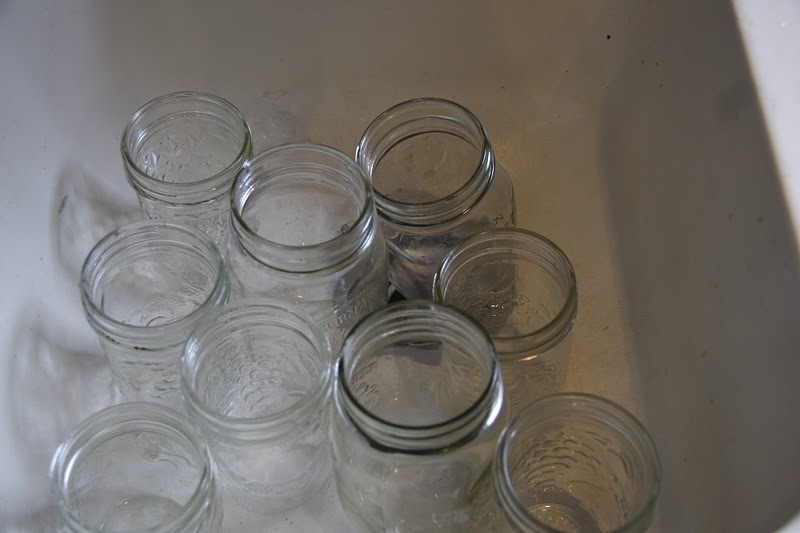 Remove jars from water-do yourself a favour and look for a special set of tongs that is meant for this job. You will only use them a couple of times a year but avoiding nasty burns is so worth it. You’ll start to hear the pop of the jars sealing almost right away. 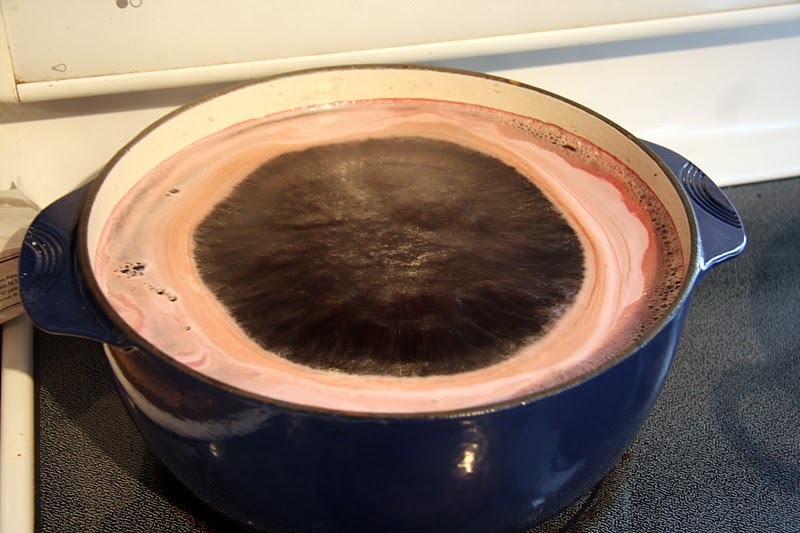 If they don’t seal within an hour then reboil OR use this jelly first (put it in the fridge). 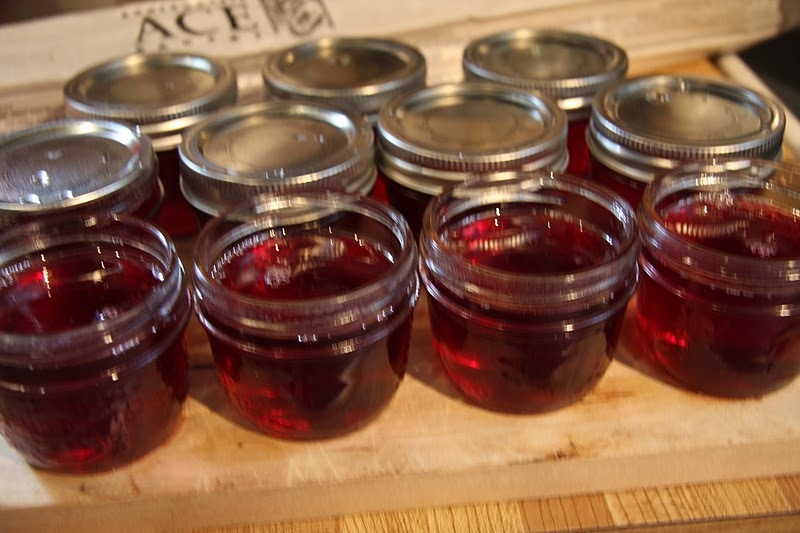 Awww….50 jars of jelly ready for my cupboard.